For my presentation this year at EdTechSA’s state conference I decided to revisit a previous presentation and reflect on my growth since that time. In this prezi, I examined how my practices have changed as a blogger, what learning experiences have worked really well for my students, and what challenges I still face. 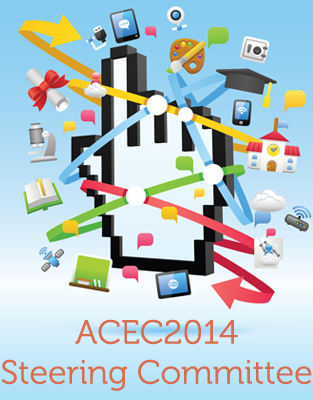 At EdTechSA 2015 I presented a workshop on the journey my class and I have taken as we went about creating our class blog. As part of this workshop I created this prezi which I am more than happy to share. 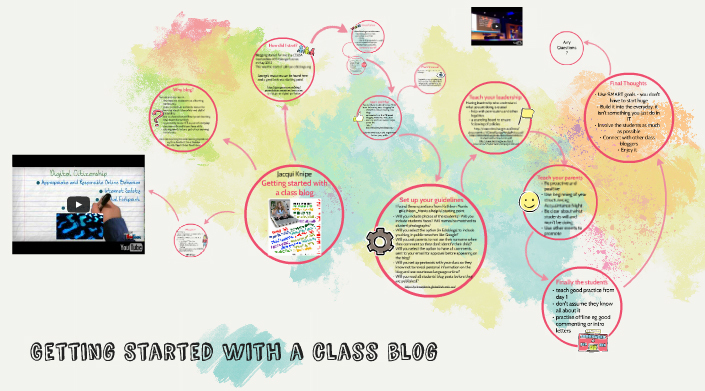 Watch this space for the sketchnote of the discussion we had about interesting elements of a class blog. Something that George Couros shared with us today at his Masterclass really resonated with me. As an ex country teacher, an aspect of teaching in a small country town that I really loved was that you saw your students in situations other than the classroom and they saw you outside of school too. 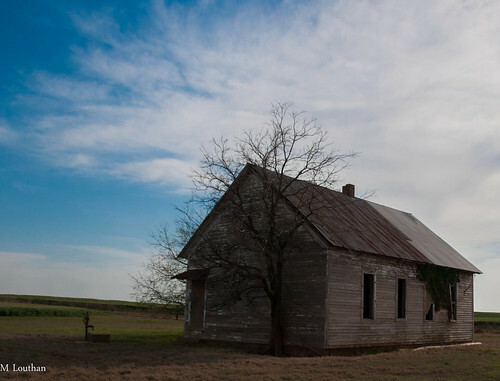 There were no Junior Primary beliefs that the teacher lived in the classroom and slept in the sickroom. Students in the country know that their teachers are real people who have lives, families, sports and interests outside of school. George spoke today of the professional effects for him of sharing important happenings from his personal life with his school and professional network. We heard how he has seen people, who only saw him in his role as a principal, change their attitude to him when they understood that there was more to him than just his work. They knew from reading his blog/twitter feed that he was a whole person and their attitude changed when they were dealing with a man rather than an administrator. Words of love and kindness uplift our own thought process as well as others. For me, this seems very similar to the regard with which teachers, on the whole, are given when teaching in the country. To use technology which is so often seen as a barrier to human connections, to open up people’s view to the fact that teachers are not emotionless bureaucrat, but rather professionals with passions and concerns of their own, can only be a benefit to our profession and our cause as a whole. George shared this video with us on how one person has been recording online aspects of his child’s growth from baby to young child which brought tears to quite a few eyes. It is amazing how quickly you grow accustomed to something and then how much you miss it when it is no longer available. Anyhow, it was while I was recently attending a non IT related conference ( yes I do go to PD that is related to other aspects of teaching too) that I realised how spoilt I have been in regards to the use social media as a major part of my professional learning. 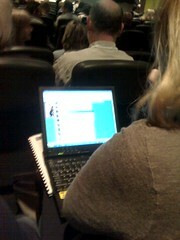 When I first arrived at the conference I noticed that I was one of the few pulling out my iPad to take notes on. That was ok. I am used to this, though it is nice now in staff meetings since our staff have been given iPads to use, that I am not the only one taking digital notes. The next major difference I discovered was the wifi. After being at many conferences/PD days where good quality wifi access is the norm, it was quite a shock to discover that at this venue the wifi was locked down and you were expected to pay quite a lot of money to access it! That was overcome too though as I just hooked the iPad up to the iPhone and voilà – internet access! However all of these are very minor problems which, as I have said, were overcome quite easily. The biggest issue I faced at this conference was the fact that the backchannel I have become so accustomed to was missing. Compare this to when I was working for CEGSA in Perth for ACEC2012, I wasn’t even in the room for most of the keynotes or sessions but I had a great idea of what was going on because of all the people in the room who were sharing their ideas/thoughts and resources along with what the keynote/presenter was putting out there. Even when I have been in the room while a session was happening, Twitter has been an invaluable provider of extra information, understanding and resources as you are able to not only have the benefit of your own interpretation of what you are learning but also that of the rest of the backchannel! This slide was about a third of the way through the opening keynote presentation of CEGSA2012. I had spent the previous few months hearing my friend and conference organiser Tina Photakis talk about how fantastic George Couros, our opening keynote was going to be and had wondered how Twitter and other web 2.0 “toys” could possibly change my professional life very much. 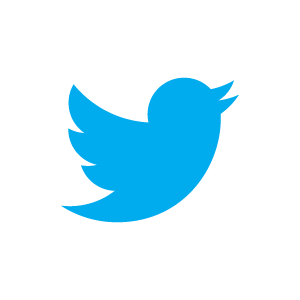 I love dabbling in technology – I already had a twitter account and followed some interesting famous people. I had a facebook account and had mucked around with a class blog at one stage too. In short I felt comfortable in this online world and it was a fun place to be. I was looking forward to hearing what this George Couros had to say but didn’t know if it would change what I was doing all that much. From the start of the keynote my perceptions were challenged about why I was using this technology and what I was getting from the online world and giving back to it. This slide in particular made me challenge my thinking about my online presence and how it could be not only a source of entertainment but also tool for professional growth and development. This slide inspired me to take charge of my digital footprint. Up until now it had been scattered – a dabble here, a play there – crazy dance-steps all over the digital floor with nothing really being used to greater potential. My first move was to gather together all that I had been toying with and decide which were the main tools I wanted to focus on. I decided, for now, upon the 5 big ones: Facebook, Twitter, YouTube, Flickr and a WordPress blog. I have since added Pinterest too as the visual nature of it appeals to my photographic senses! I then had to learn some new tools. From my work with the CEGSA blog I was familiar enough with the basics of WordPress and the others were fine too except for Twitter. People seemed to be able to do so much more with it and watching George negotiate his way through columns in TweetDeck made me see that there was a lot more too it than just reading other people’s 140 characters! So along came a TweetDeck account and now 12 (and occasionally more) columns later I have a much greater regard for this as a wonderful tool and how I can use it to learn and share with others. 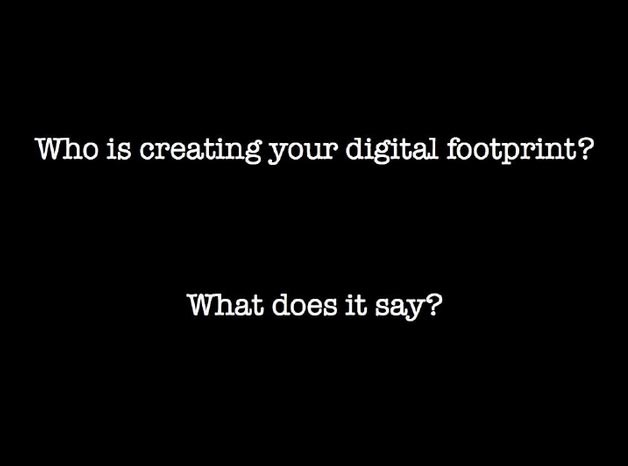 So here I am, after a few months of getting myself organised and deciding how I wanted to approach my footprint, I have now arrived at the start of my digital journey. My digital presence goes by the name of JAKnipe – JAK of all trades ( I still like dabbling in lots of things and always will). The information that is readily found about me is information I have put there and there are no eggs or cartoon avatars in sight!